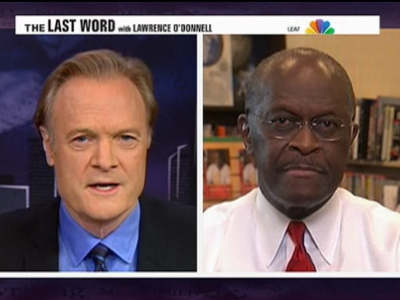 Watching MSNBC white host Lawrence O'Donnell chastising black presidential candidate Herman Cain for not participating in the 1960s civil rights movement infuriated me. O'Donnell accused Cain of cowardly sitting on the sidelines while blacks and whites marched and protested for black civil rights. How dare this white guy who does not have a clue what it was like to be black in America in the 1960s attack a black person for not responding to racism the way he thinks he should have responded. We blacks are free to live outside of your liberal stereotypical dictates. I prefer sushi over fried chicken. Does that make me “less” black? Probably yes, in the minds of arrogant liberal racists. How dare white liberals appoint themselves authorized to dictate what is and is not authentic black behavior. Based on Sharpton's betrayal of black America and his racially divisive and evil Tawana Brawley scandal, Al Sharpton is not even worthy to shine Herman Cain's shoes. And yet, this is the guy the left has appointed “spokesperson” for black America; again confirming their arrogance. Herman Cain's story is one of inspiration, courage and honor which epitomizes the American Dream. If these paragons of tolerance and compassion on the left such as O'Donnell and Sharpton truly gave a d--- about black America, they would herald Herman Cain as a hero. They would celebrate Cain as a shining example for black youths, illustrating the limitless success which can be achieved via education, hard work and character. The left views and values blacks only as pawns in their quest to portray America as the greatest source of evil in the world. The left deems happy America loving blacks who have achieved success via traditional routes such as education and hard work to be “paradigm breakers” and MUST be destroyed. So, please forgive my lack of respect for my white “would be” liberal slave massas and their traitorous black overseers. These people are evil and must be defeated.